Today, funding of long-term care services is partial in almost all European countries. This means individuals still have to co-finance, and in many cases fully finance, their care needs (except for those who fall under income thresholds and can obtain additional means-tested support). Partial public insurance opens an opportunity for insurance markets to complement public funding, such as in France and Germany, or for individuals to self-insure by using their housing assets to pay for care, typical in southern Europe. There are good reasons to argue that there is inadequate funding for long-term care, which keeps women out of the labour market and leaves some families struggling (Costa-Font et al. 2015). However, not all subsidies manage to pass the political process (for example, the Obama administration could not pass the CLASS Act, which proposed a voluntary social insurance scheme). One response to inadequate funding is to design subsidies that can serve different purposes, such as compensating family members for the burden of caregiving, including their opportunity costs of providing care, and allowing recipients to have access to adequate care. Subsidies can take different forms such as a hours of care, or cash transfer to individuals and their families. Funding can be conditioned on the provision of care, and even specify budgets for specific caregiving activities. In the midst of an economic crisis, long-term care subsidies might be seen as an opportunity to increase household income, giving rise to ‘caregiving moral hazard’. In part due to the escalating costs of subsidies, the Netherlands, which was one of the first countries to set up a funding mechanism, recently reduced the support of old-age individuals. Germany, with a social insurance model, undertook reforms in 2008 to balance the financial equilibrium of the reform. Below I discuss the welfare effects of such interventions in the context of Scotland and Spain, looking specifically at the effects on household financial wellbeing, and savings in the use of health care. Two countries in Europe expanded their subsidies for long-term care in 2002-8 – namely, Scotland and Spain. Scotland introduced ‘free personal care’(FPC), which meant that all charges for personal care at home were abolished once an individual passed a ‘needs test’ (charges continued to be in place for non-personal care). In addition, the pre-existing cash subsidy for those at home entailed a flat-rate payment of £169 per week in 2014, and those in a nursing home received an additional £77. Studies of the effects of the Scottish reform suggest that the introduction of FPC gave rise to a change in caregiving choices. Specifically, some evidence suggests an increase in informal caregiving by six percentage points (Kalsberg-Scaffer 2015) and a sharp increase in the demand for in-home help by 69% between 2002-2010 (Bell and Bowes 2012), which was compensated for by an increase in the charges for non-personal care, and the intensity of care increased from an average of 6.9 to 7.8hours. Other evidence suggests an effect on savings (Ohinata and Picchio 2015). Spain, similar to Scotland, extended a previously means-tested subsidy to the entire population based on a needs test under the 2007 ‘Promotion of Personal Autonomy and Care of Dependent People’ (SAAD). Although the subsidy was intended to allow individuals to have access to home and residential care, over time a significant share of the population opted for a cash subsidy designed to compensate informal caregivers (including social security contributions), which in 2011 reached €530 for the most severely disabled population.Figure 1 shows that after the implementation of the reform, thepopulation that relies on cash benefits increased steadily to 50% until 2012. My co-authors and I explored the effects of the reform in Costa-Font et al. (2018a, 2018b),and Costa-Font and Vilaplana (2017). Overall, the SAAD reform appears to have increased the probability of the uptake of informal caregiving by 31% and increased expenditure by 20%, consistent with significant moral hazard effects of cash payments (Costa-Font et al. 2018b) and a reduction of household savings when individuals receive cash subsidies (Costa-Font and Vilaplana 2017). However, SAAD led to savings in the form of a reduction in hospitalisation, amounting to 11% of total individual healthcare costs (Costa-Font et al. 2018a). Source: Author’s own work using data from the Ministry of Health, Social Affairs and Equality. As with subsidy expansions, long-term care services have been subject to spending cuts in the context of austerity, thus reducing the subsidies available. 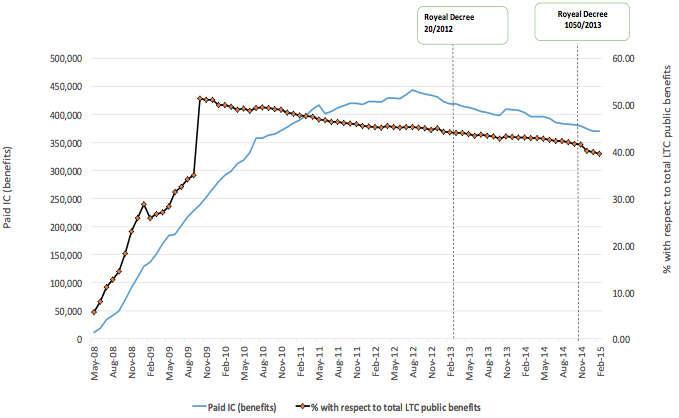 Typically, cuts have not always been transparent (e.g. increased waiting lists for accessing care in Portugal and Spain), but they mostly encompass a rise in cost sharing and private contributions. Austerity has led Ireland to cut long-term care benefits by between 5% and 8% (EFC 2012), and the Czech Republic to cut its subsidy by 60% in 2011 as part of emergency austerity measures (Hirose and Czepulis-Rutkowska 2016). In Italy, spending cuts included the cancellation of the National Fund for Dependent People (long-term care) worth €400 million, andthe 2012 spending cuts in Spain reduced the SAAD subsidy by 15%–25% (Royal Decree 20/2012). Such austerity cuts in Spain led to a reversion of all the effects described above, i.e. they reduced the provision of informal care, increased the number of hospitalisations, and reduced people’s savings (Costa-Font et al.2018a, 2018b, Costa-Font and Vilaplana 2017). All the evidence points to long-term care decisions and their external effects on the use of health services and household decisions being sensitive to public subsidies. When subsidies are unconditional and in cash, they may entail an incentive for informal care (‘caregiving moral hazard’). However, there is an argument to be made that familis can deliver a higher quality of care, due to informational and emotional advantages. Similarly, cash subsidies exert effects on household finances, unlike subsidies in care, and both cash and care subsidies can bring savings to the health system by reducing the frequency and intensity of hospitalisation. Bell, D, and AM Bowes (2006), Financial care models in Scotland and the UK, Joseph Rowntree Foundation. Costa-Font, J, and S Jiménez-Martínez and C Vilaplana (2018a), “Does long-term care subsidization reduce hospital admissions and utilization?”, Journal of Health Economics 58: 43-66. Costa-Font, J, S Jimenez-Martin and C Vilaplana (2018b), “Thinking of incentivizing care? The effect of demand subsidies on informal caregiving and intergenerational transfers”, IZA discussion paper. Costa‐Font, J, and C Vilaplana‐Prieto (2017), “Does the expansion of public long‐term care funding affect saving behaviour?”, Fiscal Studies 38(3): 417-443. Costa‐Font, J, C Courbage and K Swartz (2015), “Financing long‐term care: Ex ante, ex post or both?”, Health Economics 24: 45-57. European Foundation Centre (2012), Assessing the impact of European governments’ austerity plans on the rights of people with disabilities. Karlsberg Schaffer, S (2015), “The effect of free personal care for the elderly on informal caregiving”, Health Economics 24: 104-117. Hirose, K, and Z Czepulis-Rutkowska (2016), Challenges in long-term care of the elderly in Central and Eastern Europe, International Labour Organisation.